Earn $2.81 in Rewards credit (281 points) What's This? 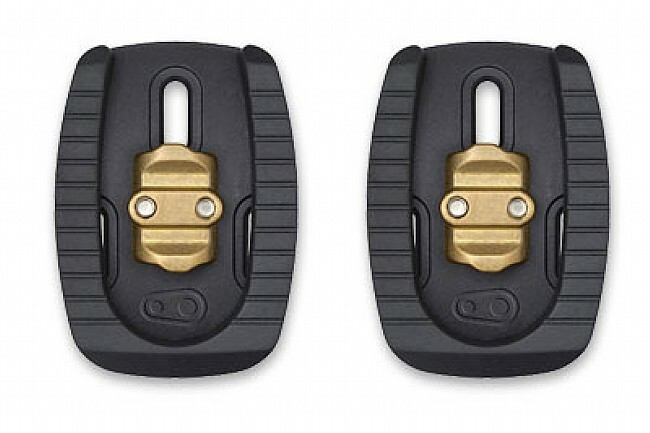 Crank Brothers cleats for your three-bolt road shoes. Composite outer bodies protect cleats while walking. Compatible with Crank Bros Quattro, Candy and Eggbeater pedals. 15° or 20° release angle. 6° float. 86 grams per pair. I use Egg Beater pedals on my road bike because I like having the same pedals for both my road and Mt. Bike. Recently though I have been having foot issues on longer rides and I decided to move onto a Road specific set-up. Found a great deal on a pair of Carbon soled road shoes and has a temporary set-up I decided to try these cleats. I don't think this is going to be a temporary set-up, everything works so well. I can use my Mt. Bike shoes for commuting or running errands and use my good shoes for longer rides. Another benefit to these cleats vs. a traditional Road cleat is because the hard plasticrubber around the outside of the adapter plate makes these easier to walk-on. I purchased these to use for commuting on a cross bike I built up. The first ride, I stopped at a light, unclipped, put my right foot down, and found the cleat protector had cracked once at work. At the end of my second commute, it had broke half off. At this rate, I will be back to shelving the road shoes I was attempting to get some use out of. Why the cleat protector is not made of rubber is beyond me. It would appear that no one at Crank Brothers has used the product to any significant extent. Great idea, but poor execution. I love Crank Brothers pedal systems. Even though CB went through a few dark years of miserable quality control and failed products. I believe their getting back on track with quality and durability. However, I've gone through 3 sets of these quattro cleats. In all cases, if you walk around on any uneven surface (gravel road, etc...), the outer composite body tends to disintegrate, and then the plastic pins that connect the base plate and the composite protective shell also get destroyed. Then you're walking unevenly, grinding our cleats into pavement or any floor surface, and you have uneven shoe to pedal contact. CB seriously needs to re-engineer these for better quality for real world conditions. When they're new and not falling apart - they are great - easy to mount, adjust, and protect the cleat very well. In addition the shoe platform they create on the pedal (eggbeaters in this case) is excellent. Great way to convert Road Shoes to MTB shoes. I wanted to convert my Fizik road shoes from Ultegra pedals to work with my Crank Bros Candy and Eggbeater pedals. The conversion is simple enough and makes for greater use of shoes that would collect dust or get sold since I don't have Ultra pedals anymore. The conversion is simple enough and took rough 5 minutes for both shoes. The downside is the removable plate that covers the 2 outside screws is a little flimsy and doesn't seat very well when placed back in the kit. I'm a large guy (230 lbs) so it may be my weight that causes some of the flex I feel when pedaling but I know that isn't all of it since I could flex the material flex in my hands as well. Despite the odd feeling the kit does provide a great solution and is only a minimal distraction to a great product. Walking in the shoes feels much like walking in any other road shoe with Ultegra or SPD style clips. The outer body is a good design to protect the brass clip much like your MTB shoes would with the tread of your shoe which your road shoe wouldn't normally have. The only thing I would change is how the outer body connects to the base so that it doesn't flex under pressure as much as it does which probably won't be an issue for lighter riders. I have several bikes, all with Crank Bros pedals. I also have two different pairs of road shoes - summer and winter. Using these cleats with road shoes means I can do some limited walking in them as a commuter, but to address another comment, you can't walk very far regularly or the plastic collar that keeps the cleat from the ground will wear out. Arguably this aspect could be better, but I don't really want to walk much in stiff bike shoes anyway. This obvious alternative is to buy mountain shoes or some purpose built bike commuter shoes, but I prefer to use low end road shoes and these work well with that approach. I bought these so I could use road shoes as well as mountain bike shoes. They have worked out well. At first I had difficulty in clicking in but now that is not an issue. Also gravel can get in between the cleat and the mount. But I am glad I bought them. All road shoes are difficult to walk with. These don't require covers. Nice cleats, walking pads stink! These cleats work well, like all Crank Brothers items. But, the snap on walking pads are terrible!! The have completely self destructed after three uses and minimal walking. Now, I'm walking directly on the cleat. Too bad.